Powhatan: My daughter speaks with the wisdom beyond her years. We've all come here with anger in our hearts, but she comes with courage and understanding. From this day forward, if there is to be more killing, it will not start with me. Pocahontas: [singing] You can own the earth and still / All you'll own is earth until / You can paint with all the colours of the wind. John Smith: Look, we don't have to fight them. Thomas: John, what's gotten into you? John Smith: I met one of them. John Smith: And look, it's food. John Smith: It's better than hardtack and gruel, that's for sure. Governor Ratcliffe: [takes the corn and throws it on the ground] They don't want to feed us, you ninnies! They want to kill us! All of us! They've got our gold, and they'll do anything to keep it! John Smith: But there is no gold! Governor Ratcliffe: [sarcastically] And I suppose your little Indian friend told you this. John Smith: Yes. Governor Ratcliffe: Lies! Lies, all of it! Murderous thieves - there's not room for their kind of civilized society! John Smith: But this is their land! Governor Ratcliffe: This is my land! I make the laws here! And I say anyone who so much as look at an Indian without killing him on sight, will be tried for treason and hanged! Wiggins: [gives Percy a bath] Hurry now, Percy. We must be all squeaky clean for the New World. Pocahontas: [explaining her dream to Grandmother Willow] Well, I'm running through the woods, and then, right there in front of me, is an arrow. As I look at it, it starts to spin. Gradmother Willow: A spinning arrow? Ooh, how unusual. Pocahontas: Yes. It spins, faster and faster and faster, until, suddenly, it stops. Gradmother Willow: Hmm. Well, it seems to me, this spinning arrow is pointing you down your path. Pocahontas: But, Grandmother Willow, what is my path? How am I ever going to find it? Gradmother Willow: Your mother asked me the very same question. Pocahontas: She did? What did you tell her? Gradmother Willow: I told her to listen. All around you are spirits, child. They live in the earth, the water, the sky. If you listen, they will guide you. Pocahontas: And we are all connected to each other in a circle in a hoop that never ends. Pocahontas: [as she throws herself over John Smith, who is about to be executed] No! Pocahontas: If you kill him, you'll have to kill me, too. Pocahontas: I won't! I love him, Father. Pocahontas: Look around you. This is where the path of hatred has brought us. Pocahontas: This is the path I choose, Father. What will yours be? Governor Ratcliffe: [to Thomas, regarding his lack of skill with muskets] You, learn to use that thing properly. A man's not a man unless he knows how to shoot. Grandmother Willow: There's still some snap in these old vines! John: Like all the others, I suppose. I've seen hundreds of new worlds, Thomas. What could be possibly different about this one? Lon: [to John] Are you coming on this voyage, too? Ben: Of course he is, you half-wit. You can't fight Indians without John Smith. John: That's right. I'm not about to let you boys have all the fun. Lon: This place gives me the creeps. Savages could be hiding anywhere. Ben: Aye, well if you spot one, don't ask questions, just shoot. Lon, Ben: [they pass Grandmother Willow who trips them with her root] WHOA! Lon: It wasn't me, it was the tree. Ben: [afraid] Let's get out of here. Lon, Ben: [Grandmother whips them both with her vines] OW! Lon: But what about Smith? Ben: He's a big lad. He can take care of himself. John Smith: [to Thomas] Keep both eyes open when you shoot. You see twice as well. 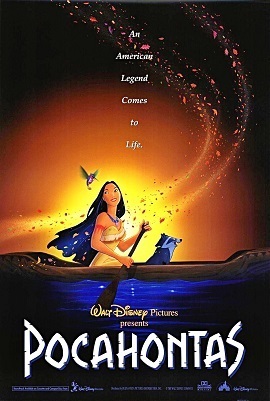 Pocahontas: John: You have the most unusual names here, Chechomony, Kuyukanhoic, Pocahontas. John Smith: Pocahontas: You have a most unusual name too... John Smith. Nakoma: Pocahontas wants to look into the eyes of the man who killed Kocoum. Nakoma: Don't you think we're getting a little old for these games? Nakoma: Oh, he is so handsome. Pocahontas: [jokingly] I especially love his smile. Pocahontas: Father, for many nights now, I've been having a very strange dream. I think it's telling me something's about to happen, something exciting. Powhatan: Yes, something exciting is about to happen. Pocahontas: [eagerly] Really? What is it? Powhatan: Kocoum has asked to seek your hand in marriage. Powhatan: I told him it would make my heart soar. Pocahontas: But he's so... serious. Powhatan: My daughter, Kocoum will make a fine husband. He is loyal and strong, and will build you a good house, with sturdy walls. With him, you will be safe from harm. Pocahontas: Father, I think my dream is pointing me down another path. Powhatan: This is the right path for you. Chief Powhatan: When I see you wear that necklace… you look just like your mother. Ben: Smith! There you are! Lon: We were looking all over for you. Ratcliffe: Smith! Where have you been? John Smith: I was... out scouting the terrain, sir. Ratcliffe: Excellent. Then you must know the Indians' whereabouts. We'll need that information for the battle. Ratcliffe: We will eliminate these savages once and for all. John Smith: No! You can't do that. John Smith: They're not savages. They can help us. They know the land. They know how to navigate the rivers. [Meeko pulls out an ear of corn and gives it to John] And look, it's food. Ratcliffe: [takes the corn and throws it on the ground] They don't want to feed us, you ninnies! They want to kill us! All of us! They've got our gold, and they'll do anything to keep it! Ratcliffe: [sarcastically] And I suppose your little Indian friend told you this? Ratcliffe: Lies! Lies, all of it! Murderous thieves - there's no room for their kind of civilized society. Ratcliffe: This is my land! I make the laws here! And I say anyone who so much as looks at an Indian without killing him on sight, will be tried for treason and hanged! Ben: Ratcliffe wouldn't take us halfway 'round the world for nothing. Lon: But what if Smith is right? What if there is no gold? Settler: If you ask me, Ratcliffe's been lying to us since we left London. Ben: Listen to you, you bunch of idiots! Those savages didn't attack us for nothing. They're hiding something. Lon: If they do have the gold, we'll have to fight them for it. Kocoum: What's wrong? Is she all right? Nakoma: I think she's in trouble. Ben: Is he going to make it, Thomas? Thomas: The sooner he gets back to England, the better. Lon: Well, let's hope the wind is with him. Thomas: Is the ship ready yet? Ben: Any minute now. Just loading the last bit of cargo. Ratcliffe: [muffled] How dare you! Untie me at once! I'll have your heads for this! Powhatan: I told you to stay in the village. You disobeyed me! You have shamed your father! Powhatan: Because of your foolishness, Kocoum is dead! Grandmother Willow: Well, I haven't had this much excitement in 200 years. Pocahontas: What am I doing? I shouldn't be seeing him again. I mean, I want to see him again. Grandmother Willow: Who wouldn't? I want to see him again. Pocahontas: But still, something inside is telling me it's the right thing. John: So what river is this? John: You have the most unusual names here, Chechomony, Quiyoughcohannock, Pocahontas. Pocahontas: You have a most unusual name too... John Smith. Gradmother Willow: Oh! Your mother's necklace. Pocahontas: That's what I wanted to talk to you about. My father wants me to marry Kocoum. Gradmother Willow: Kocoum? But he's so serious. Pocahontas: All of this happened because of me… and I’ll never see John Smith again. Nakoma: Don't go out there. I lied for you once. Don't ask me to do it again. Pocahontas: I have to do this. Nakoma: He's one of them! Pocahontas: You don't know him. Nakoma: If you go out there, you'll be turning your back on your own people. Pocahontas: I'm trying to help my people. Nakoma: Pocahontas, please. You're my best friend. I don't want you to get hurt. Pocahontas: I won't. I know what I'm doing. Pocahontas: Ma-ta-que-na-to-rath (I don't understand). John: You don't understand a word I'm saying, do you? Thomas: Captain John Smith! I’ve heard some amazing stories about him. Thomas: [as a bugle is being played] John, you better get down here! The governor's coming ashore! John Smith: [blows an attacking Flik away from his face] All right, all right! I'm leaving. John: [goes to shake Meeko's hand] It's alright, it's just a hand shake. Here let me show you. John: No. No, I need your hand first. [She holds her hand out and he shakes it] It's how we say hello. Pocahontas: This is how we say hello. Wingapo. Pocahontas: And how we say goodbye. Ana. John: I like hello better. Thomas: [to Pocahontas, about John after being wounded] Going back is his only chance. He'll die if he stays here. Kocoum: Nakoma, where is Pocahontas? Nakoma: I... I haven't seen her. Kocoum: Pocahontas can't keep running off. It's dangerous out there. Tell her that. She listens to you. Nakoma: [sarcastically to herself] Huh. Sure she does. John Smith: Pocahontas, that tree is talking to me. Pocahontas: Then you should talk back. Grandmother Willow: Don't be frightened, young man. My bark is worse than my bite. John Smith: What do you say to a tree? Wiggins: I made it myself. Powhatan: This is what we feared. The paleface is a demon / The only thing they feel at all is greed. Kekata: Beneath that milky hide, there's emptiness inside. Warriors: I wonder if they even bleed. Powhatan: Killers at the core. Kekata: They're different from us, which means they can't be trusted. Powhatan: We must sound the drums of war! Governor Ratcliffe: I've never been a popular man. Governor Ratcliffe: And don't think I don't know what those back stabbers at court say about me. Governor Ratcliffe: I'm very well aware that this is my last chance for glory. But mark my words, Wiggins. When King James sees the gold these peasants unearth, success will be mine... at last. Governor Ratcliffe: [taken away in chains, muffled] How dare you! Untie me at once! I'll have your heads for this! Wiggins: [tearfully] And he came so highly recommended. John Smith: [about Meeko eating his hardtacks] Is this bottomless pit a friend of yours? Wiggins: [to Percy, waving a chicken leg] Who's a good doggy, hmm? Who's a good doggy? Wiggins: [throwing the chicken leg away] Fetch, boy! John Smith: Come with me? Powhatan: You must choose your own path. Pocahontas: [pause] I'm needed here. Wiggins: Do you think we'll meet some savages? Governor Ratcliffe: If we do, we shall be sure to give them a proper English greeting. Wiggins: [holds up baskets of wine and cheese] Ooh, gift baskets! Governor Ratcliffe: Oh, no. And he came so highly recommended. Grandmother Willow: What do you see? Governor Ratcliffe: [singing] The gold of Cortez, the jewels of Pizarro / Will seem like mere trinkets by this time tomorrow. / The gold we find here will dwarf them by far. / Oh, with all you got in ya, boys / Dig up Virginia, boys. Grandmother Willow: Come closer, John Smith. Grandmother Willow: He has a good soul. And he's handsome, too. John Smith: Oh, I like her. Pocahontas: I knew you would. Governor Ratcliffe: [after Powhatan has released John Smith] Now's our chance! Fire! Thomas: They let him go! Ben: They don't want to fight! Governor Ratcliffe: It's a trick, don't you see? Fire! Governor Ratcliffe: Fine! I'll settle this myself! John Smith: [seeing Ratcliffe] No! Governor Ratcliffe: He... he stepped right into it! It was his own fault! Thomas: [looking at Kocoum's body after shooting him] Is he...? Pocahontas: [Pocahontas rushes at Thomas] Get away from him! Pocahontas: [shouts] He killed him! John Smith: [they hear other Indians approaching] Thomas! Get out of here! John Smith: [yells] Get out of here! Governor Ratcliffe: You there, where's Captain Smith? Ben: [knowingly] Aye, your singing must've scared him off! Governor Ratcliffe: Well, then go get him, for heaven's sake! Lon: What if we run into the Indians? Governor Ratcliffe: That's what guns are for. Now arm yourselves and get moving! John Smith: We've improved the lives of savages all over the world. John Smith: Uh, not that you're a savage. John Smith: No, I'm not letting you leave. John Smith: Look, don't do this. Savage is just a word, uh, you know. A term for people who are uncivilized. [he grabs a branch, but the branch is not strong enough to hold his weight, and John falls back to the ground. Pocahontas jumps down after him] Pocahontas: What you mean is, "not like you." Pocahontas: [singing] You think I'm an ignorant "savage" and you've been so many places; I guess it must be so, but still I cannot see if the savage one is me. How can there be so much that you don't know? You don't know. Ben: [Captain John Smith has just jumped off the ship during a storm to save Thomas] Smith! Are you crazy? Governor Ratcliffe: [Thomas is staring after John Smith, who has just snuck off to see Pocahontas. Ratcliffe appears behind him and pushes him out the fort] Follow him. Thomas: [standing to attention] Yes, governor. Governor Ratcliffe: I want to know where he's sneaking off to. Governor Ratcliffe: Oh, and Thomas... you've been a slipshod sailor and a poor excuse for a soldier. Don't disappoint me again. John Smith: [about Percy and Meeko] You see what I mean? Once two sides wanna fight, nothing can stop them. Pocahontas: [Percy and Meeko circling around her] C-Come here, both of you! John Smith: It's all right! He's only a friend! Bad! Bad dog! Sit! Pocahontas: What are you doing? Meeko! John Smith: Percy, get back here! What are you doing? Stop that! Grandmother Willow: All right! That's enough! Grandmother Willow: It's enough to make your sap boil. Grandmother Willow: Oh, a dream! Let's hear all about it! Pocahontas: We don't have to fight them! There must be a better way. Powhatan: Sometimes our paths are chosen for us. Pocahontas: But maybe we should try talking to them. Powhatan: They do not want to talk. Pocahontas: But if one of them did want to talk, you would listen to him, wouldn't you? Powhatan: Of course I would. But it is not that simple. Nothing is simple anymore. John Smith: They're not gonna listen to us. Lon: [Lon and Thomas are gazing at the new world for the first time] It's incredible! Thomas: And it's all ours. I've never seen anything like it! Ben: [approaching] It could look like Ratcliffe's knickers for all I care, so long as we get off the stinking boat! Pocahontas: [hugs him] I'm so sorry. Pocahontas: [tearfully] It would've been better if we never met. None of this would've happened. John Smith: Pocahontas, look at me. I'd rather die tomorrow than live a hundred years without knowing you. Pocahontas: I can't leave you. John Smith: You never will. No matter what happens to me, I'll always be with you, forever. Ben: [kicks him] Alright, you howling nutter! Get to work! Lon: Come on, Ben, it's just a little fun. Ben: [sarcastically] Oh, sure, we're having loads of fun. Right, look at us - no gold, no food, while Ratcliffe sits up in his tent all day happy as a clam. Governor Ratcliffe: [in his tent] I'm doomed! I should be wallowing in riches right now, and I haven't found as much as a speck!